This is an unfortunate fate for an art form. Why? Because polemics eventually turn audiences into skeptics, skeptics into cynics, and cynics into people who don’t like art. It’s a vicious cycle, and one generally ignored by all those who claim to create art “for a cause.” The more an artist’s imaging of truth gets warped towards the right or the left, the more they manipulate their audience’s heartstrings at the cost of reality, the more the cause outweighs the humanity, the more futile the “cause” becomes. The casualty here is true objectivity, a beast the documentarian has had to tackle since the genesis of the art form. The question is this: If imitative art is always subjective in its portrayal of reality, what happens when imitation is removed and reality is merely imaged? Can objectivity be reached through a lens? I admit that I have become calloused towards an increasingly frustrating yet always entertaining art form, and want the best for its future after Ken Burns retires. But I have hope for the documentary. And this hope was reignited by watching livestock for two hours. Sheep, in particular. Hundreds and hundreds of sheep. The documentary Sweetgrass is something of a meditative odyssey surrounding the fate of the American West. The film tells the story of a group of Montana cowboys that lead their sheep to summer pasture in the Absaroka-Beartooth Mountains. The journey is 150 miles long and has been done for over a century, but only a handful of cowboys still attempt it. You would think that a documentary set in Montana, subtitled “The Last Ride of the American Cowboy,” directed by anthropologists from Harvard, would be replete with the typical slant you see in documentaries today. But that couldn’t be further from the truth. Made by Lucien Castaing-Taylor (recordist) and Ilisa Barbash (producer), and bordering on the definition of an ethnographic film, Sweetgrass explores the favorite cinematic cliché of cowboys without delving into hackneyed imagery or nostalgia, and is respectful to its topic, to say the least. The film traverses the Montana landscape, starting at the end of winter before the sheep are sheared. As the film slowly moves into spring, the focus is shifted from the mesmerizing personalities of the animals to the tormenting hands of the cowboys as they embark upon the journey through mountains they both love and hate. The filmmakers capture such realistically grand images that you wonder how much money Hollywood studios would have to spend to replicate such transcendentalist eye candy. The film brings you into the violence of creation on scopes both large and small. In one scene, we witness the darkly comic birth of a lamb, assisted by a ranch hand, in close-up. The lamb is born into a circus of chaos—bleating choruses of sheep, humming machinery, cowboys tossing slippery infants on top of one another—and we see the awkward difficulty of a shepherd’s task. At another point we witness the same type of chaos, of man against nature, as a panoramic shot is underscored by the frustration of a cowboy attempting to wield nature. In a futile effort to herd his sheep up a hill, the cowboy screams a slurry of curses so creative that you wonder if you might be witnessing a contemporary Greek tragedy. From a distance we see the little specks of white wool scatter up the mountain from a valley, the cowboy utterly furious in all his limitations, as a massive cloud slowly moves into frame over the valley, asserting its cosmic reign. It is in this contrast—the close-up intimacy with a strange beast and the landscaping enormity of Montana’s beast of nature—that Sweetgrass transcends a “nature documentary.” You can sense the anthropological scalpel of the filmmakers, making it all the more trustworthy, and ironically, all the more artistic. Metaphors abound in every image both small and large, the most direct being a mysterious looming sign posted on the forest’s edge that reads “Wilderness” as the cowboys exit the very wilderness they’ve toiled in, returning home after tackling the epic pass. The film at times feels like spiritual parable. Sheep, shepherds, mountains, nature, mysterious beasts attacking flocks. Every shot makes you want to look underneath the image, to search for meaning in the utter enormity of nature. It is the stark and committed imaging of truth that sets this documentary apart from others. There is no commentary. There is no music. There is nothing but the footage, which achieves a sort of minimalist epic quality, and strips away any trap of sentimentality or heartstring tugging or worldview persuading. It is a strange joy that for once you can watch a cowboy’s silhouette riding his horse across the spine of a mountain, singing some ancient melody, yelling at his dog, and think, My God, it’s real. What Mr. Castaing-Taylor has achieved is the unthinkable task of making the cowboy myth reality. The film could have chosen to tackle the political aspects of public grazing rights for ranchers and the plight of the ranching industry (a topic that deserves a good deal more attention from all of us—especially those of us who make laws). But wisely, Sweetgrass veers away from that temptation, making you wonder if the political divisiveness surrounding such issues might be trounced by the sheer sympathy garnered in the objective telling of such a story. 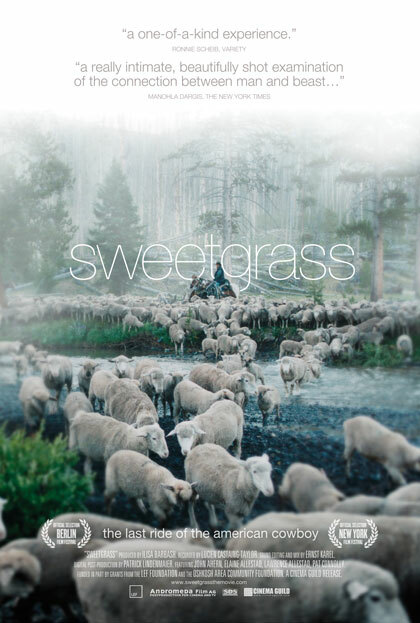 Perhaps due to its ethnographic emphasis, Sweetgrass approaches objectivity as gracefully as Ansel Adams. Its story and images evoke the notion that creation alone is enough to earn our sympathy, that there is art in purity, that stories are honored with unflinching realism, and that the best artists are devoted truth-tellers.